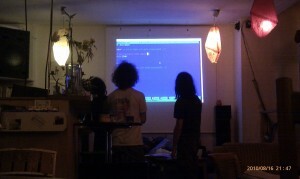 We watched a lecture from CCC congress 24C3 at Samacafe yesterday to get ideas how to organize hackerspaces and linux user groups. It was presented on the congress in 2007 by Lars Weiler and Jens Ohlig. “Design Patterns” are presented in the lecture: many typical hackerspace-orga problems are identified and a possible solution is presented. Some design patterns also match for living together in communities, others are optimized for nerds and their special lifestyle.